>On the last weekend of October at Trevince House there was a men’s study weekend. 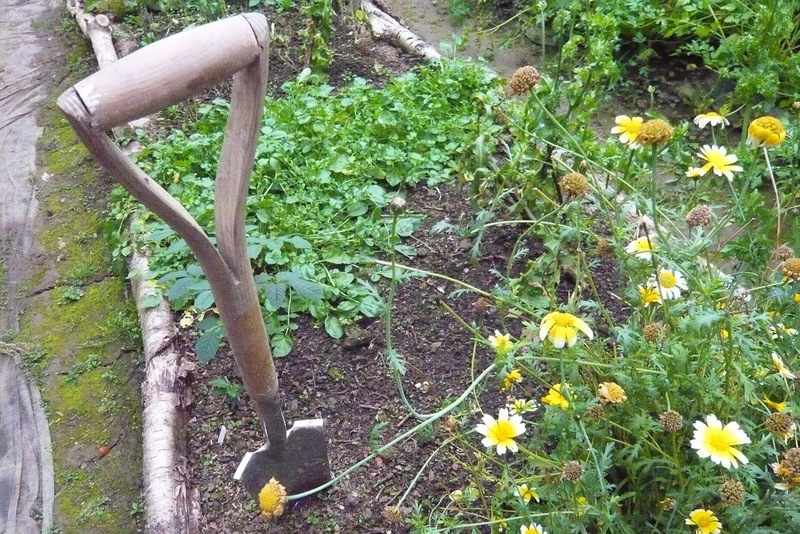 The women of the household had to vacate the premises and decamp to Easterbrook Farm where we have an allotment space, which Trevince House has recently taken responsibility for. Easterbrook farm is owned by a friend of Buddhafield and there Buddhafield stores, in one of the barns, all of Buddhafield’s tents and equipment. Vans are also parked there over the winter. We use the loft as a space to mend our canvases for the forthcoming season and it is where we hold the annual team retreat. Easterbrook, with its beautiful surroundings, is an important resource to us. Both of us, Rosie, Alice, Liz and Abie were all present at this weekend and it soon became clear that we all share a passion for growing vegetables following permaculture ideals and using herbs for their culinary and medicinal properties. The garden’s creator, Dharmamrta also shares these same values and took us on a guided tour of what is planted where. Dharmamrta started this garden as a right livelihood business, supplying the festival and cafe with specialist salad leaves through the season. She built a poly tunnel, creating the entire garden from a patch of grass. She is now doing other things but lent her time to us to show and explain what is in the garden and her reasonings for planting what she did. Alongside Dharmamrta, Abie has been it’s nurturer for the last year or so, growing flowers at Easterbrook from April 2010. Previously, she had an allotment in Norwich on which she grew flowers on for a year, using them to make bouquets as gifts. This, being her main success, made her decide to buy lots of seeds, and she approached The Greenhouse in Crediton as a place to sell locally grown cut flower bouquets. They were delighted and very supportive in giving it a go. Dharmamrta had grown Echinacea and Rudbeckia ‘Black Eyed Susan’ and Abie planted alongside those Calendula, Centaurea Cyanus ‘Black Ball’, Blue Cornflowers, Ammi Majus ‘Bishops’s Flower, Ammi visnaga white, Zinnias, Dahlia’s, Sunflowers, Sweet peas (though the deer ate all of these) Salvia Patens and Achillea. You may have seen some of these flowers which so beautifully decorate some of the shrines at the retreats. 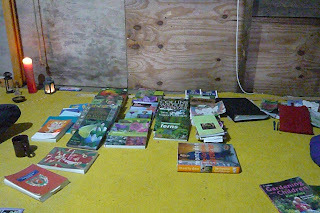 Abie brought with her an amazing number of books on Buddhism and gardening, which were laid out ceremoniously next to our modest shrine amid exclamations of excitement! As the weather was very wet and the sewing loft cold, us resilient women spent time drinking tea whilst looking at books and discussing what our future plans for the garden may be, and touching on subjects that concern Buddhism and our gender such as abortion, feminism and being a parent. Many times a cry of ‘Hey! listen to this!’ was heard as we individually discovered little gems of knowledge to do with herbs, the earth or Buddhism. On Saturday night Abie led a simple three-fold puja, her first time leading one, which was really beautiful. We both felt really touched to be present at this, as Abie has been really instrumental in furthering our understanding of Buddhism, helping answer our questions and trying to point us in interesting and fruitful directions on where to look for answers. Abie has been really enthusiastic and supportive about both this blog and us taking on the garden. She has been really generous with her time and the gathering at Easterbrook would not have been the same without her! Big sadhu! Late Sunday morning the rain eased off and we bumbled round the garden in our wellies and water proofs, taking pictures and making notes on what plants and herbs were in the garden, what needed to come out and what spaces were available for developing. Dharmamrta visited us on Sunday afternoon, and we collectively worked in the garden. Rosie and Dharmamrta cleared a bed in the polytunnel, digging up the sunflowers which had been there, and whose heads now hang from a light fixture on the wall in the living room at Trevince, waiting to dry so their seeds can be harvested. Ruth and Alice cleared a small bed outside and replanted lambs lettuce that had self seeded, for a mid winter green feast. Lou cleared out old cucumbers and the smaller self seeded lambs lettuce in another bed whilst uncovering more and more hibernating slugs. The whole bed was mulched with a thick layer of Elecampagne leaves that grow elsewhere in the garden. Abie cleared behind the shelves that edge one side of the poly tunnel and Liz cleared out the basil that had been prolific and had now died off and did some general weeding. As the light failed Ruth went to put the kettle and started cooking dinner while the others finished up in the garden. We meditated and then had dinner and finished the evening reading aloud from ‘The Jewel in the Cabbage which draws parallels between cooking and Buddhism in very interesting ways, being mostly cafe crew it was something that we could all relate to. This marked the end of our gardening weekend at Easterbrook, later that evening we all returned to the warmth of Trevince House and had tea with our male counterparts. This entry was posted in Easterbrook, Gardening by TaraGreen. Bookmark the permalink.